When creating your calendar try and keep things simple by using a calendar or organizational software you are already used to like Google Calendar, Google Sheets, or Microsoft Excel. 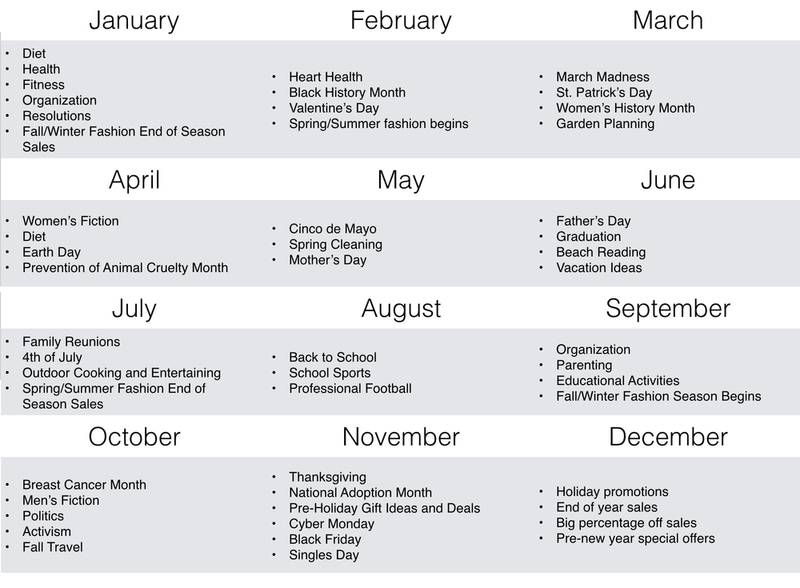 You can also get marketing calendar templates or services from the following companies. These are just a few examples and there are many more not listed here. Once you’ve selected which program you are going to use to keep track of your events, you need to fill in the key points that you’ll keep track of. Here are a few main points to note. Date: When will the campaign, content, or event go live? Type of Campaign: List the type of content or campaign you’ll be running. For example: blog, email, tradeshow, social post, display advertising, etc. Owner: Who is responsible for creating this content? Status: Note the current status of the initiative as it moves through its development lifecycle. There are many more details you can fill in to help you stay organized but always keep an eye on the main goals. Whether you are a sole proprietor or a have a large marketing team behind you, the most important part of you calendar is the delivery date and the person that will own the content or campaign. This will help to keep you and your team aware of important deadlines and will hold everyone accountable. Every industry has a specific sales cycle associated with the industry. Start with a blank 12-month calendar and begin to outline the important events that are specific to your business. In fashion, for example, Spring end of season sales ramp up in July. Utilize this calendar as a jumping off point for key events in the coming year. Outline at least one marketing opportunity that you can deploy each month. Have fun and be creative. While this list is a great jumping off point, it’s by no means all-inclusive. Take some time to research the events that are relevant to the niche or industry you participate in. Also note any events that are specific or special to your business like a company anniversary. These are great opportunities to share your story with your following, prospects and customers. For the coming year, plan at least one promotional event for your product or service each quarter. Promos, discounts, and giveaways are a great way to woo new customers and engage your existing clients. Here are a few examples that you can use. Planning your calendar is the first step — Now it’s time to execute on it. As the Chinese proverb goes, “vision without action is a daydream.” Use your calendar as a point of reference for important events. Hold yourself to your calendar but know that things will change along the way. Opportunities will present themselves, budgets will change, and priorities may change. But always keep in mind that success doesn’t just happen, it’s planned for.